A handwritten letter of encouragement for new mothers was left in a supermarket baby-changing area. It was one of 20 left at various locations by Ren Benson, from York, who said she just wanted to give other mothers support. "I am a first-time mum, my little boy is 10 months now, and parenting is really hard," she said. 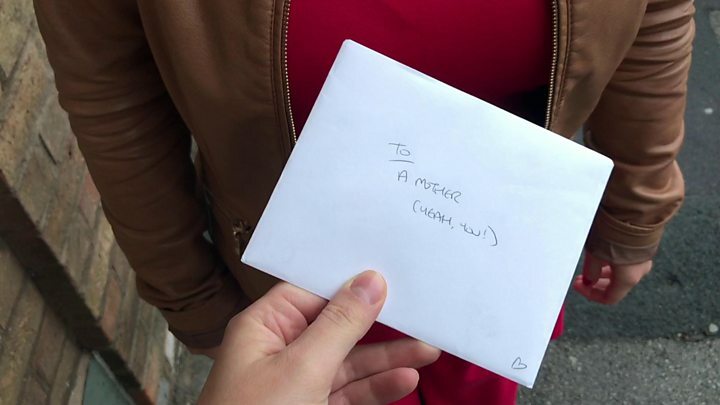 Emma Lowe, who found the supermarket letter, said it was a "lovely gesture" and very welcome. On parenting, Miss Benson said: "It is really challenging and there are times when you do feel like you are just on your own and a little bit falling apart." The first letter was left after she had dropped her shopping in the supermarket and felt she was at the "end of her tether". "I thought 'this is the time when I need some love - there must be another mother who is going to feel this way'," she said. Miss Benson said she was inspired by other mothers' random acts of kindness for each other through the online community - The Motherload. "Such a small gesture and it can make the world of difference at times." Mrs Lowe found the letter as she changed her daughter and said it had made her day. "I ignored it at first, but on the envelope it said 'yeah you'. "I opened it and thought what a lovely, lovely gesture that someone has taken the time to handwrite the note to say 'you know you've got this'. "As a first-time mum it is really challenging at times, but I thought that is so lovely that someone has done that and left it for someone to find."